Developing new social & emotional skills during middle childhood is critical to supporting positive academic, health, and career outcomes at all ages to follow. When children are able to understand and manage their emotions they are better able to build and maintain positive relationships, regulate their own behaviour, and develop resilience. Children thriving in this dimension often experience happiness in everyday activities and have learned to manage their emotions even in difficult situations. They are able to call on inner resources to calm themselves when upset, show compassion to and spontaneously help others, try to stop quarrels, and invite peers to join in activities. Thriving children can maintain their focus, listen attentively, work independently and think before they act. As they mature, children with well-developed social and emotional skills are likely to engage in volunteer activities and engage with their community. Empathy is the foundation for healthy social relationships and academic achievement and is a necessary precursor for prosocial behaviours. Empathy is the experience of being able to take another person’s perspective and feel what that person is feeling. Empathy can be taught and nurtured when adults model prosocial behaviour and verbalize empathic feelings, especially during conflict situations. Optimism refers to the mindset of having positive, yet realistic, expectations for the future and putting in effort towards making good things happen. Optimism helps children manage stress and develop coping behaviours. Children high in optimism tend to have higher self-esteem, stronger self-regulation, more motivation to achieve and reduced depression and anxiety. Self-regulation refers to a person’s ability to adapt their behaviour, attention, emotions and thoughts in response to what’s going on around them. Sitting still when appropriate, the ability to defer reward and positive self-talk are a few key examples. Self-regulation contributes to positive school engagement, teacher-student relationships and academic competencies in middle childhood. Self-regulation is also important for preventing children from taking part in risky behaviour, which tends to increase as they move into adolescence. Prosocial behaviour is voluntarily choosing behaviours that help and benefit others, such as sharing and cooperation. Prosocial skills help children have healthy relationships with adults and peers, can protect them against bullying, anxiety and depression, and can improve academic achievement. Sadness can be healthy response to hurtful encounters, disappointment, and loss, and will abate as circumstances change. The complete absence of sadness is not a requirement for well-being. However, children should not experience overwhelming feelings of sadness frequently, or untethered from specific circumstances. Having some worries is normal, and being able to think about possible future outcomes, good or bad, is a hallmark of cognitive development in the middle years. But when children cannot stop thinking about their worries or begin to worry about many things excessively, their well-being is negatively impacted. Children who cope well with worries typically have less intense negative emotions and fewer extreme emotional reactions in social situations. Happiness refers to how content or satisfied children are with their lives. More than just feeling good, children with a positive, friendly attitude are more likely to attract positive attention from peers and adults, develop positive personality characteristics, and have healthy relationships and living environments. Experiencing happiness also strengthens children’s coping resources when negative experiences occur. Self-Esteem refers to children’s perceptions of themselves and sense of self-worth. It is based on how children judge their own abilities in different situations, such as academics, athletics and with friends. Having a healthy self-concept (neither overly high nor low) is critical for middle childhood health and well-being and strongly linked to children’s satisfaction with life. Self-awareness is the ability to accurately recognize the influence of emotions and thoughts on behaviour. 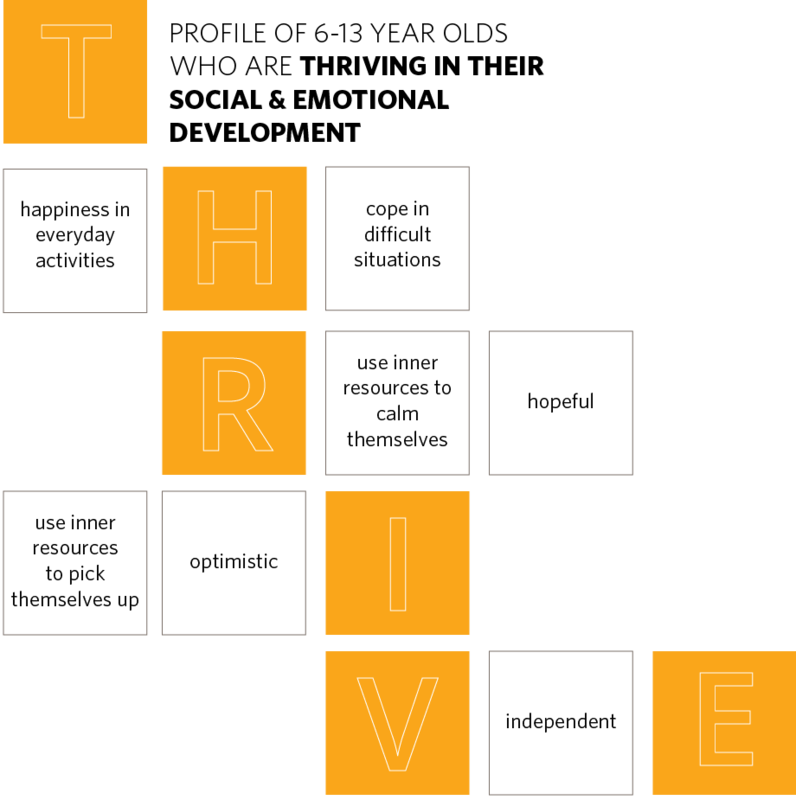 It means being able to accurately assess one’s strengths and limitations, while possessing a well-grounded sense of confidence and optimism. As children develop self-awareness they become more skilled in recognizing and regulating their emotional reactions, thus allowing them to re-engage with difficult problems and find the skills needed to cope with or solve challenges. 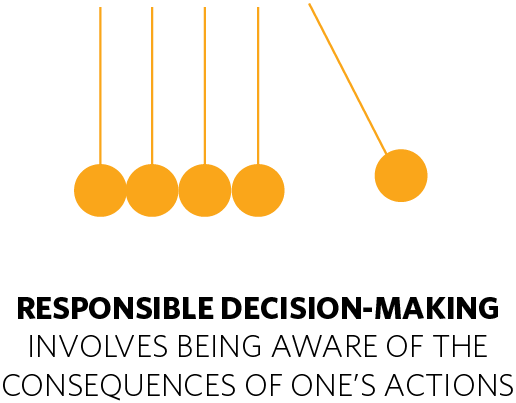 Responsible decision-making involves the ability to make choices that benefit one’s own interests while also being respectful toward others. This includes being aware of the consequences of one’s actions. Ethical choices based on awareness and consideration for others builds civic responsibility, positive relationship skills, and compassion. Perseverance refers to the persistent effort to achieve one’s goals, even in the face of setbacks. Middle childhood is a time when children begin to distinguish between effort and ability and can learn to value and find motivation in hard work. Encouraging perseverance is especially important after negative events to avoid learned helplessness and low self-image. Assertiveness includes the ability or willingness to communicate one’s point of view and to stand up for oneself, while at the same time respecting the perspectives of others. As children learn to develop assertiveness, they increase their ability to recognize and speak openly about their feelings and desires, reach compromises with others, cope with rejection or criticism, build and maintain self-esteem and self-respect, expand self-awareness and self-evaluation, and communicate more effectively. 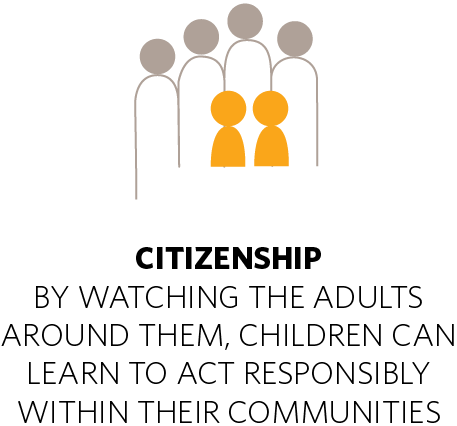 By interacting with the world and by watching the positive examples of the adults around them, children can learn to act responsibly within their communities, help those in need, and develop skills to improve society. The MDI asks children whether they believe they can make a difference in this world, whether they actively try to make the world a better place, and whether they have volunteered or plan on volunteering in the future. Exploring ways to cultivate pro-social behaviour in middle years children.